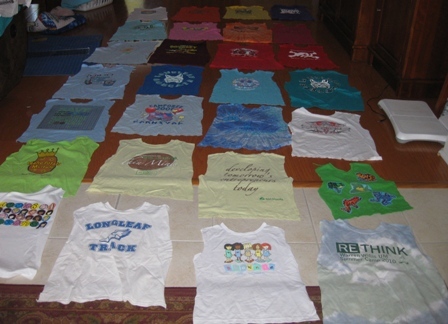 I think I mentioned that I got a bag of t-shirts at swim team this morning. I was doing laundry and sanitizing the house for most of the day. Ryan is feeling much better, though he slept most of the day away. Oh, I also put the finishing touches on Sydney's doll house. It is moved into the toy room and she is getting her family moved in already. After dinner though, I sat down with a pair of scissors and started cutting apart shirts. It is so fun to see all the shirts and the events that they each represent. Schools, scouts, vacations, sports... what a fun collection. After rough cutting the fronts, I dug out the lightweight fusible interfacing and cut out some 13 inch squares. 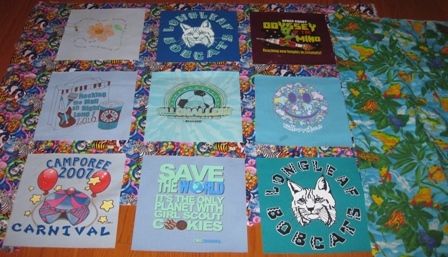 When I've done adult quilts, the shirts ended up somewhere around 18 inches square, but these are kid sized shirts, so 12 inches is going to work better in this case. 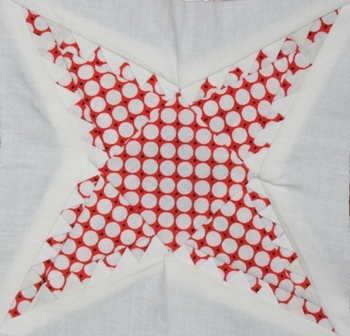 The interfacing gets ironed onto the back, centered behind the design. 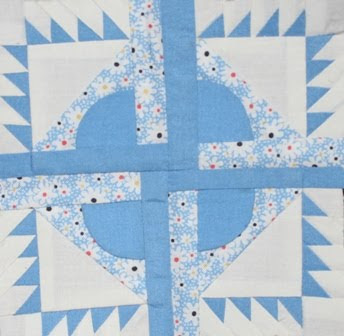 After whacking off the extra fabric, I use a large square up ruler to trim the finished block. The shirts came with three fabrics. I'll have to think about how to arrange them. I really like the frogs. The first 9 blocks got done before I ran out of interfacing. I guess I'd better make a trip to a fabric store soon. Well, I guess if I HAVE to go and shop I'll make the best of it. I love brand new months. For those playing along with the Rainbow Scrap Challenge it is the start of a brand new color. So, go grab your YELLOW scaps and start thinking about sunshine and summer and happiness. 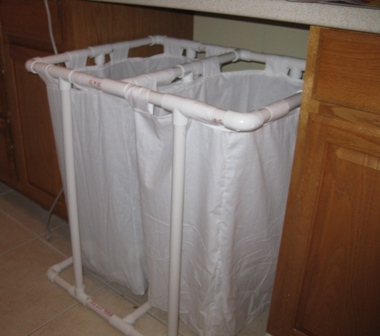 I had Kurt cut some PVC pipe to make a hamper to fit under the counter-top in the laundry room. The kids put it together and then I made fabric liners for it. One for darks and one for lights. It isn't exactly a quilt, but it was a sewing project that needed to be done. I saw my friend Ashyln at swim team this morning and she gave me the shirts and fabric to make a t-shirt quilt for her daughter. 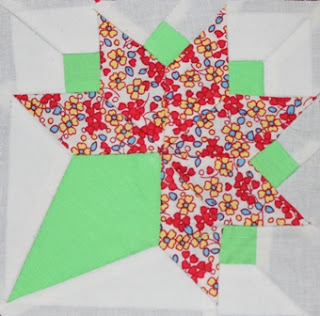 It always makes me a little nervous to make quilts for other people, but still excited about having a new project to start. After that it was the bug guy and the lawn guy while sanitizing everything in the house to try to keep the girls from getting the stomach bug that Ryan came down with in the middle of the night last night. I'm hoping he doesn't share, but it never seems to stay that isolated. The girls are all snuggled up watching a movie right now and I've been doing summer cleaning and organizing. Aah, the lazy days of summer! Kurt took me to Orlando for my birthday. He arranged sleepovers for all of the kids, made reservations for a hotel and a restaurant and got tickets for a show. Isn't he sweet? It is officially summer vacation! Well, honestly, it has been summer vacation for almost a week now, but it hasn't quite felt that way yet. I mentioned earlier that I was getting a new room for next year. Our school was built in 1957 and although new rooms have been added since then, some have been around since the beginning of time. I wasn't exactly thrilled about being moved, and so asked permission for a bit of a room makeover. Not only did I get permission, but also some extra help and support. 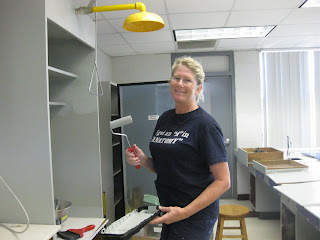 This is my department chair who came in to help with the painting. She is absolutely fabulous and I am so lucky to be working with her again! 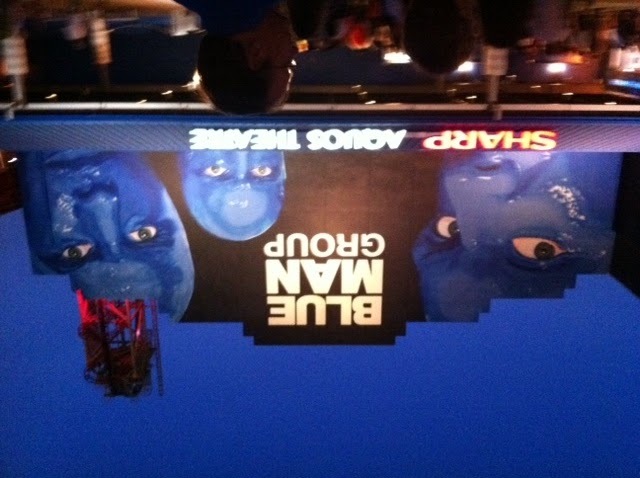 Even the kids got in on the action. Ryan did a great job attaching handles and hinges. Anna helped move drawers in and out while Sydney had a blast with putty and glue. I am sure they were not completely thrilled with starting summer vacation at school, but they were good sports about it. Three days wasn't quite enough to finish all that I have in mind, but it made a huge dent. The paint is fresh and clean, the grime is scrubbed away. 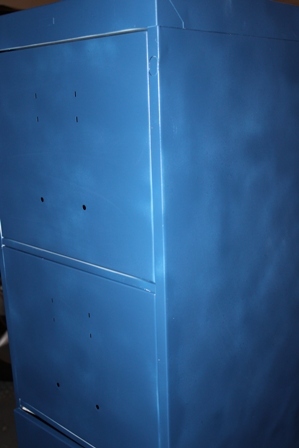 I've got covers made for the cubbies where students hide their cell phones and nifty plugs for the sinks as well. 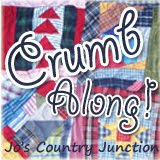 There is some fabric involved as well, which I will use for a little window valance and bulletin board cover. 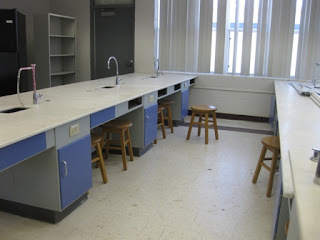 So with the bulk of my classroom renovation under control, I'm ready to switch gears for summer projects. I've pulled out a stack of flimsies awaiting borders that are first on the list. Last night while watching TV with the family, I sorted through scraps and cut them into strips and squares. I'm not sure what I'll start with, but anticipation is all part of the fun. Swim team starts bright and early in the morning and then I have an entire day to sew and hang out with the kids. Sometimes being a teacher is a really good thing! It is the last Saturday and May. I hope everyone is finishing up on pink. 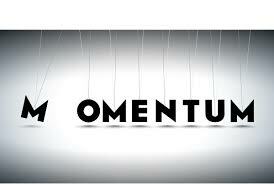 There are 4 more days in the month in case you still have a bit of work to do. Post your progress using the links below. Happy ScrapHappy Saturday! This is Midget Block 42. I've been putting it off because I don't think it is particularly attractive. 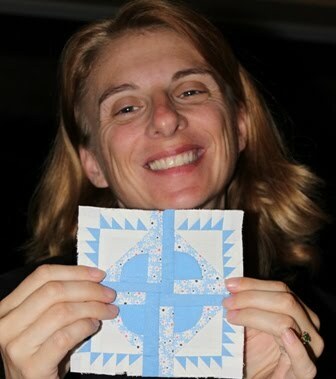 It has 36 pieces with sadly mismatched points and was paper pieced. Thankfully it also has pitifully bad contrast, so I'm sure it won't be horribly noticeable in the end. It is called Whirlwind. Glad to cross it off the list. I spent some time this afternoon tidying in the sewing room and catching up on ironing and sorting of leftovers. Most of the weekend was spent hanging out in the garage. Ryan is building an air cannon with Kurt and the girls are working on an old model train kit. 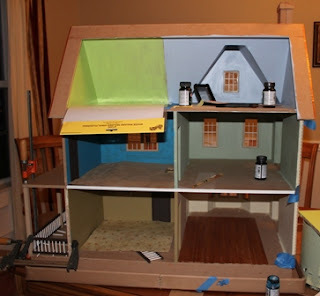 I've also been chipping away at painting the dollhouse. Sydney has moved her furniture in and is anxious to have it done. I made some covers for the student sinks in my new classroom, apparently they like to throw garbage in them. I also made some cubby covers with the extra wood. Rumor has it that they like to hide their phones in there while texting during class. Tomorrow is the last day of school and Thursday is scheduled for painting. Friday was Sydney's sleepover party. Those pictures are on the other camera though, so I'll save it for another post. Today I am thankful that there are 4 Saturdays in May. Still plenty of time to finish up something pink. What are you working on today? We got a notice at work yesterday that there was a giveaway for teachers of office supplies and furniture. Kurt volunteered to come with me to help in case I needed anything carried. Since I'm getting a new classroom next year, I'll be in need of shelves and cabinets. Although I wasn't lucky enough to get any shelves, I did bring home a file cabinet. I spent the afternoon with some blue spray paint and I think it will look pretty good when I am done with it. 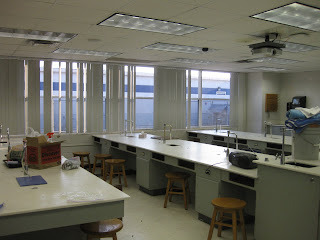 My "new:" classroom isn't really new and is need of a little TLC, but I have some plans for fresh paint and some happy curtains that should make things I a bit cheerier. After that I worked on some more painting in Sydney's dollhouse.She picked out all of the colors and has been a big part of helping to put it all together. She wants to have it ready to play with for her birthday party next weekend, so we've kicked it into high gear. Unfortunately Kurt got impatient waiting for me to do my part and he put it all together before I could do most of the interior painting. It would have been so much easier to do when the pieces were all nice and flat and spread out, but I am making it work. I tried not to swear out loud as I used a mirror to see the ceilings and trimmed out the edges in tricky nooks and crannies. Kurt was out of town all last week and took a red-eye home on Thursday. Therefore, I went out after work on Friday for a little "me" time. I made a trip to Joann's for the new Quiltmaker 100 blocks issue and found some fabric to try out on the purple and green quilt. 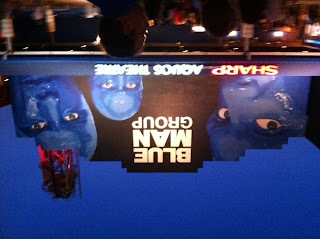 I also watched a movie and saw two of my students working at the theater. Graduation in on Wednesday and then there are are just three more days of exams with the underclassmen until the year is officially done. Feeling pink today? Use the linky below to show your progress during the pink month. Two more Pink Saturdays to go, so no need to feel pressured or rushed. This one is called Illinois World's Fair. 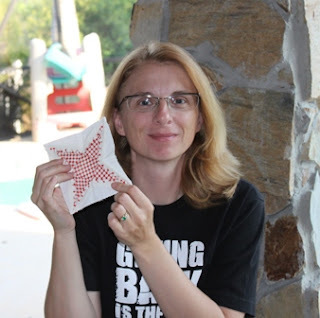 It has 88 pieces and is paper pieced with applique additions on the center. It came together pretty quickly after pizza and before bedtime. I do think I've had enough of the little triangle bits for a while though. I like the contrast in this one. 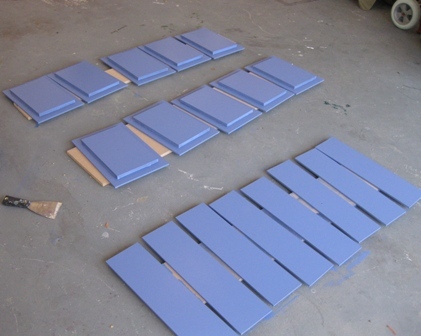 The next one has two similar shades and I think it will all blend together when it is done. I'm still sticking close to the original colors, even if the colors wouldn't have been the ones I would have chosen. Anna is off on a sleepover and Ryan has a friend sleeping over here. We finally pulled everyone out of the pool and they are all sleeping soundly. I've been enjoying a mother's day movie marathon but won't be far behind the kids in the sleep department. I hope you all enjoy your mother's day tomorrow. I found some inspiration today to pull out my Midget Blocks. They got seriously pushed onto the back burner when things got busy with the new job. This one is called Pine Bur. It is block #39 and has 65 pieces. 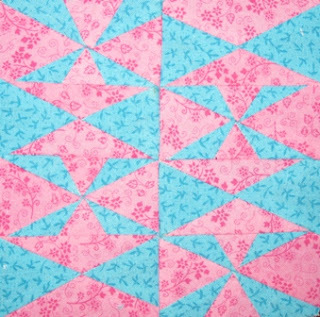 It is paper pieced (easy but slow) and then sewn together with inset seams (impossible for me to do well for some reason). Sewing by hand is the preferred method for inset seams, but I didn't want to take the backing out, and I'm definitely not hand sewing through foundation paper. The corners are a bit puckery, so I may try to straighten those out a bit. #40 was sitting finished in the binder already, I skipped ahead just a bit to have some hand sewing on our Thanksgiving car trip. It looks fine to me now, but I remember spending some quality time with an iron convincing it to lie flat. 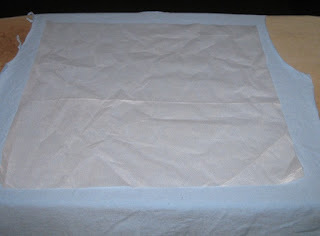 I cut the pattern out of freezer paper with no seam allowance and trimmed around each adding in the extra quarter inch. Then I just sewed along the edges instead of taking the paper off and marking the seam allowance. Anna's dress rehearsal for the ice skating mother's day recital was this morning. She is John Darling from Peter Pan. 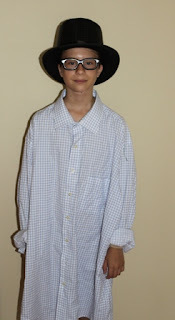 I popped out the Goodwill yesterday to find her an extra large men's shirt to use as a costume. I found a bagful of blue shirts while I was there which will make great quilt fabric at some point in the future. Then she went to her play tryout. There were only 32 kids for 50 parts, so I think her chances are good. Most of today was spent sitting by the porch watching the kids swim. Summer is in sight and it is looking good. Happy weekend! I'm feeling pink today, how about you? Post all your fun pink projects below. 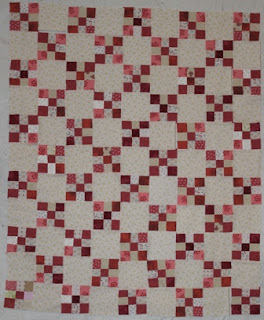 I used some nine patches left over from the Bonnie Hunter mystery Double Delight quilt. I've been a little bit carried away with nine patches lately and have a big stack waiting to turn into something fabulous. These little guys are just alternated with some plain background squares. I am so happy to FINALLY get a jump on Scraphappy Saturday! Things at school are on a definite downward slope. The AP Biology exam is on Monday and at that point it will be about wrapping things up. I'll be moving rooms again, so I've been busy getting things packed up and organized again. Fortunately I didn't exactly settle in to my new room when I changed schools so it shouldn't be too difficult to move everything. I'd like to do a little decorating in the new room though, it isn't quite as nice and new as the room I'm in now. Today was Sydney's class field trip to the zoo. Kurt volunteered to chaperone. Yesterday was Anna's 5th grade trip to Sea World and he was a chaperone for that as well. I guess he is all volunteered out for a while. Ryan's 4th grade trip is Monday, but he didn't really want any of us to come along. This weekend is the Mother's day recital for Anna's theater on ice. She is also trying out for a play. That may be all for the weekend. Football is over, OM has ended, Girl Scouts are wrapping up.... wow, thing might settle down into a peaceful pattern for a while. I wouldn't mind spending a little time at home for a change. I'm having my AP Environmental students do a terracyling project as a little change of pace after the big exam. After putting some ideas together today to get them started, I was inspired to do a little project of my own. I had sewn a cover at some point in the past for the binder to use as a grade book, but it didn't survive the wash and I needed something new. 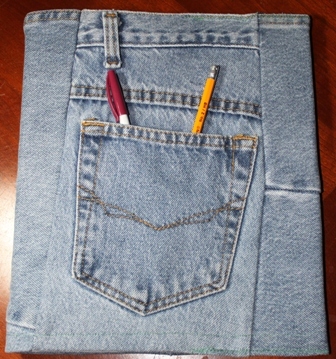 Check out the strategic pocket placement for pencils. Seriously, how cute it that? If you've ever cut up an old paper bag to cover a textbook, then you know just how to make a fabric cover for a binder. The fabric gets cut to the right width and hemmed up. 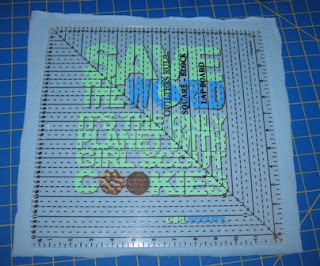 It is then folded over at the ends and stitched along the edges so the binder can get slipped in. This is the second one that I made, I accidentally sewed the pocket onto the back the first time. Thankfully jeans have two pockets though, so the second time I paid more attention. Has anyone guessed that PINK is the new color for May? 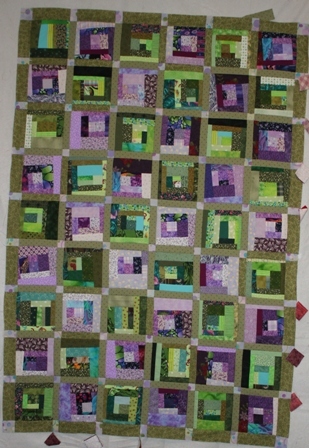 The purple and green blocks are officially sewn together. I went out looking for a nice purple and green border fabric but couldn't find just the right combination. 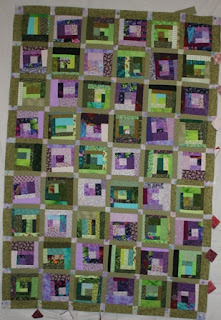 The only purple and greens together tended toward lime when I had a more sage variety in mind. I couldn't find a nice flannel for the back either, so I might use random 10 inch squares of green instead. I've got a lot of greens hanging around for an Irish chain that hung around in the planning stages but never made it any further. 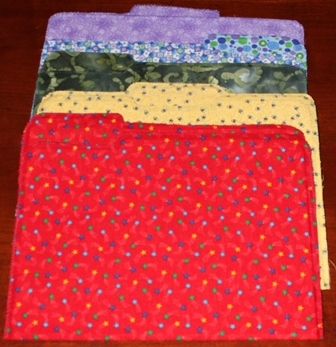 I also finished off the fabric covered folders from a couple of weeks ago. 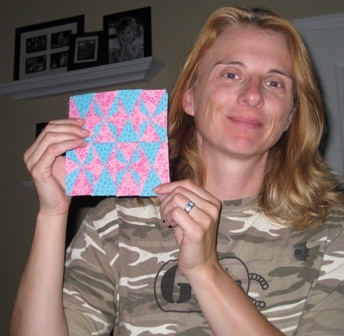 They just needed zig zag stitching around the edges to be officially finished. When that was done I was still having fun hanging around the sewing room so I started digging out old projects and organizing a bit. I've been having fun with the rainbow scraps, but after the new job came along, I started dropping things along way. 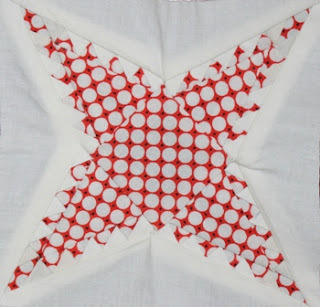 I've still got blue crumbs up on the design wall and all the blocks made for an adorable red nine patch on point. Now that I've got the purple and green top all sewn together I might spend some time this week working on those. Tomorrow is the AP Environmental test. I've got 72 students who should be showing up bright and early. I have a griddle and pancake fixins all set to go for breakfast before the test. I'm thinking after that things should start to settle down. The Bio test is still a week away, but they are in review mode.